Support RHM! Click the cover to order now from Amazon.com. With the Dredd film due for release in September, are you looking for a classic introduction to the world of Judge Dredd? The brand new Judge Dredd: The Complete Case Files 05 collection is coming to North America on 19th June – and now’s the perfect time to discover Mega-City One for yourself. The perfect collection for new readers looking to discover Dredd, this volume gives you two of his greatest stories – The Dark Judges and The Apocalypse War. With breathtaking artwork from Brian Bolland, Carlos Ezquerra, and Mick McMahon, Volume 05 is full of some of the most seminal moments in the character’s history, including the terrifying undead superfiend, Judge Death, and his Dark Judges – Judge Fear, Judge Fire, and Judge Mortis – who hail from a world where all life has been declared a crime! And in mega-epic The Apocalypse War, a Soviet invasion sees half the city disappear beneath mushroom clouds as swarms of hovercraft bring in waves of deadly tanks and ruthless kill-bots. All seems hopeless, so Dredd himself must lead a suicide mission to try and save his city. Also included in this edition are some of the all-time classic Dredd stories, giving the new reader an insight into the moment this comic book icon came into his own. 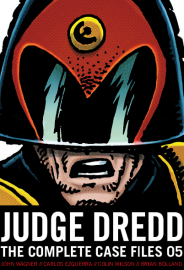 Dive into the insane world of Judge Dredd with a volume that will blow you away!